All our cylinders and pistons are made to the high durability trademark ABSAF standard. • Standard cylinder. Externally this is the same as the original BSA Gold Star cylinder, the construction is however far superior, and like all the standard ABSAF parts it is fully interchangeable with the original parts. This cylinder does not have a cast iron liner, but is made in one piece. The bore is lined with nikasil, which has several advantages: nikasil ensures good heat conduction to the cooling fins and piston clearance to the barrel is only 0.04mm. As a result of this reduced clearance high oil consumption and smoky exhaust fumes are a thing of the past. Nikasil is very resistant to wear which in turn dramatically decreases piston deterioration. The bore is 85mm. • 600cc cylinder. Reinforced to stop the cylinder losing its' shape, with a slightly bigger bore (90mm). Also the cylinder head bolts are encapsulated which gives the cylinder greater strength and makes it less prone to deformation. • Racing cylinder. 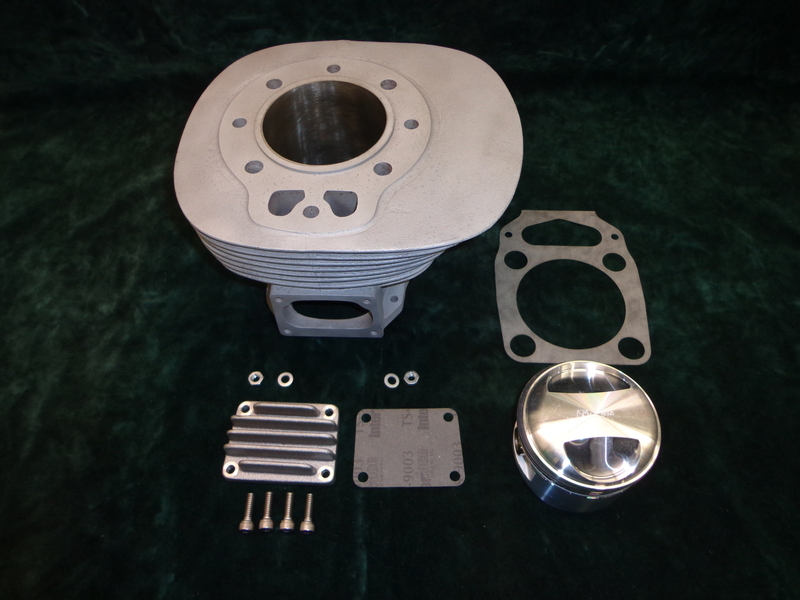 Except for the bore, which is again 85mm, this cylinder has the same specifications as the 600cc cylinder, it is reinforced and has encapsulated cylinder head bolts. For the 500cc racing cylinder the reinforcements are not to compensate for loss of material inside the barrel, but to help the cylinder maintain its' shape under extreme dures..
• ABSAF pistons are made of forged material and have the best piston rings and gudgeon pins made of crucible steel which enable them to withstand long periods of maximum charge. In a standard engine it means that they will probably never wear out. • Gaskets have been improved too. The cylinder and cylinder head of an ABSAF engine have been specially adapted so that the tradition "peel off" gaskets can be disposed of. The ABSAF cylinder head gasket is a one piece gasket with a thickness of 0.5mm. • The four long cylinder head bolts are made of a new kind of steel with very high tensile strength and greater elasticity, to cut out the problems caused by breakage with all its' dire consequences. ABSAF is a small company, led by Jan de Jong. He started making BSA Gold Star parts to keep his own racer going, back in 1981, and made more and more parts for friends and other racers, it became a full-time occupation. All company, badge and type names as well as all trademarks are in possession of it’s rightful owners. This covers especially BSA, Matchless and Velocette trademarks. We only use them to allow customers to select and assign suitable replica parts from our product range. Please bear in mind that our products are made strictly for racing. Details on liability can be found in legal page. Copyright © 2018 Absaf. All Rights Reserved.